In the Ancient Future, sometimes fans only find out about the concerts after they are over. To avoid temporal displacement, visit the current concert schedule page often! Below is a list of confirmed public concert dates for 2015. See also private events. Saturday, January 17, 8 PM, Concerts at the Farm, Munay Farm, Petaluma, CA. Concert location emailed upon completion of online purchase or phone reservation. Info: info@ayniprojects.com or ian@iandogole.com. Tickets/Reservations: $25. Tickets are available online or at the door if you reserve in advance by calling 415-990-9042. Doors open: 7:00 PM (for hors d'oeuvres, wine and something sweet before the concert). Info: Email info@ayniprojects.com or ian@iandogole.com. Facebook Event. Friday, March 27, 8 PM, Air Craft with Doug McKeehan (keys) and Bruce Bowers (violin), Piedmont Piano Company, 1728 San Pablo Ave,Oakland, CA 94612. Tix: $20 reserved/door. Info: 510-547-8188. Facebook Event. Saturday, March 28, 8 PM, Air Craft with Doug McKeehan (keys) and Bruce Bowers (violin), MACLA Black Box Theater, 510 South First Street, San Jose, CA 95113. Tix: $20 reserved/door. Info: 408-998-2783 x28. Facebook Event. Sunday, April 19, 7:30 PM, Original Ancient Future Reunion with Mindia Devi Klein (flutes), Benjy Wertheimer (tabla), and Matthew Montfort (guitars) plus special guests, 142 Throckmorton Theatre,142 Throckmorton Avenue,Mill Valley, CA 94941.Tix: $20 adv, $25 at door, $35 reserved seating. Advance tix at http://tinyurl.com/ou8aeez. Doors open at 7 PM. Info: 415-383-9600 or visit www.142ThrockmortonTheatre.com. Press Release. Facebook Event. Tuesday, April 28, 7:30 PM, Ancient Future with Matthew Montfort (scalloped fretboard guitar) and Vishal Nagar (tabla) plus special guest Jason Everett (bass), The Royal Room, 5000 Rainier Ave S, Seattle, WA 98118. Info: Call 206-906-9920, email tristan@theroyalroomseattle.com, or visit theroyalroomseattle.com. Tix: $15 adv/$18 door. Press Release. Facebook Event. Wednesday, April 29, 8 PM, Ancient Future with Matthew Montfort (scalloped fretboard guitar) and Vishal Nagar (tabla) plus special guest Jason Everett (bass), O Space, 18870 103rd Avenue SW, Vashon, WA 98070. Info: Call 206-408-7241, email info@openspacevashon.com , or visit openspacevashon.com. Tix: $15 adv/$18 door. Press Release. Facebook Event. Thursday, April 30, 7:30 PM, Ancient Future with Matthew Montfort (scalloped fretboard guitar) and Vishal Nagar (tabla) plus special guest Jason Everett (bass), The Conway Muse, 18444 Spruce St., Conway, WA 98238. Info: Call 360-445-3000, email elfa@conwaymuse.com or visit conwaymuse.com. Tix: $15 adv/$18 door. Press Release. Facebook Event. Saturday, May 2, 5:30 - 7 PM, Ancient Future with Matthew Montfort (scalloped fretboard guitar) and Vishal Nagar (tabla) plus special guest Jason Everett (bass), Moscow Renaissance Fair, Main Stage East City Park, 3rd and Hayes, Moscow, ID 83843. Free. Info: Visit moscowrenfair.org and facebook.com/moscowrenaissancefair. Press Release. Thursday, May 7, 8 PM, Acoustic Guitar Summit with Teja Gerken , Tim Sparks, and Matthew Montfort, Throckmorton Theatre, 142 Throckmorton Ave, Mill Valley, CA 94941. Tix: $18 advance/$22 door/$30 reserved seating. Advance tix at http://tinyurl.com/mxzywve. Info: 415-383-9600 or visit www.142ThrockmortonTheatre.com. Facebook Event. Sunday, May 17, 2 PM, Ancient Future with Matthew Montfort (scalloped fretboard guitar),Vishal Nagar (tabla), and special guest, Himalayan Fair, Live Oak Park, 1300 Shattuck Ave., North Berkeley, CA 94709. Saturday, June 6, 2 PM, Ancient Future with Matthew Montfort (scalloped fretboard guitar) and Vishal Nagar (tabla), Rohnert Park-Cotati Library, 6250 Lynne Conde Way, Rohnert Park Expressway / State Farm Drive, Rohnert Park, CA 94928. Free. Info: www.sonoma.lib.ca.us. Sunday, June 21, 4 PM, Ancient Future Guitar and Tabla Duet with Matthew Montfort (scalloped fretboard guitar) and Vishal Nagar (tabla), The Mazza Castle, 900 Mirador Terrace, Pacifica, CA 94044. $40 per guest, includes wine and refreshments. Limited to 45 seats. Reserve tickets early at Brown Paper Tickets. 4 PM - Gather with refreshments. Music begins promptly at 5 PM. Info: 650-355-0272. Saturday, June 27, 2 PM, Ancient Future Guitar and Tabla Duet with Matthew Montfort (scalloped fretboard guitar) and Vishal Nagar (tabla), Sonoma Valley Regional Library, 755 West Napa Street, Sonoma, CA 95476. Free. Info: www.sonoma.lib.ca.us. Thursday, July 23, 12 noon, Ancient Future World Beats for the Whole Family with Matthew Montfort (scalloped fretboard guitar) and Vishal Nagar (tabla), Children's Discovery Museum of San Jose, 180 Woz Way, San Jose, CA 95110. Performance free with paid museum admission. Info: Call 408-298-5437, email contactus@cdm.org, or visit www.cdm.org. Saturday, August 22, 11:30 AM, Ancient Future Guitar and Tabla Duet with Matthew Montfort (scalloped fretboard guitar) and Vishal Nagar (tabla), Central Santa Rosa Library, 211 E Street, Santa Rosa, CA 95404. Free. Info: www.sonoma.lib.ca.us. Saturday, August 22, 2:30 PM, Ancient Future Guitar and Tabla Duet with Matthew Montfort (scalloped fretboard guitar) and Vishal Nagar (tabla), Petaluma Regional Library, 100 Fairgrounds Dr, Petaluma, CA 94952. Free. Info: www.sonoma.lib.ca.us. 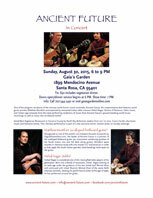 Sunday, August 30, 2015, 6 to 9 PM, Ancient Future Guitar and Tabla Duet Vegetarian Dinner Concert with Matthew Montfort (scalloped fretboard guitar) and Vishal Nagar (tabla), Gaia's Garden, 1899 Mendocino Avenue, Santa Rosa, CA 95401. Tix: $30 includes vegetarian dinner. Doors open and vegetarian cuisine served beginning at 5:30 PM. Show time: 7 PM. Info: Call 707-544-2491 email djmama@sonic.net, or visit gaiasgardenonline.com. Saturday, September 12, 2:30 to 3:45 PM, Ancient Future Guitar and Tabla Duet Matthew Montfort (scalloped fretboard guitar) and Ferhan Qureshi (tabla), Globe Institute Sound Healing Conference and Festival, Sound Garden Main Stage Concerts, Kaiser Center Tower, 300 Lakeside Drive, Oakland, CA 94612. Info: 415-777-2486. Sunday, August 30, 2:15 pm, Will Woods interviews Matthew Montfort on KRCB, Rohnert Park, CA 94928. Includes a live radio performance with Mariah Parker joining him on santur. Streams live at radio.krcb.org. Sunday, August, 16, 2015, Matthew Montfort is interviewed on Curtain Call on KRCB, Rohnert Park, CA 94928. Host Charles Sepos chats first with Pacifica String Quartet violist, Masumi Per Rostadt. Next, world guitar pioneer Matthew Montfort talks about his musical life and about his world fusion group, Ancient Future.The interview ends with a preview excerpt of a soon to be released live concert featuring Vishal Nagar (tabla), Matthew Montfort (scalloped fretboard guitar), and Jason Everett (bass). Listen to the archived show at feeds.feedburner.com/KRCBCurtainCall or on iTunes. Friday, January 10, 2014, Matthew Montfort is interviewed on Curtain Call on KRCB, Rohnert Park, CA 94928. Host Charles Sepos chats first with Chinese pipa virtuoso Wu Man. Next, author Nick Bantock talks about his latest book. Finally, World guitar pioneer Matthew Montfort previews his performance with renowned Indian tabla virtuoso Vishal Nagar. Listen to the archived show at feeds.feedburner.com/KRCBCurtainCall or on iTunes. Thursday, October 21, 2010, Matthew Montfort and Mariah Parker performed a live studio performance and interview on Bryan Chandler's show on KUSF, San Francisco, CA 94117. Listen to the archived show at kusf-archives.com. Thursday, April1 , 2010, WorldStreams with Dari interviewed Matthew Montfort and Mariah Parker, WorldStreams.org. Permanently archived online at WorldStreams.org. Thursday, January 14, 2010, Matthew Montfort performed a live studio performance and interview on Bryan Chandler's show on KUSF, San Francisco, CA 94117. Listen to the archived show at kusf-archives.com. Due to decades of arts cutbacks, many of the presenters most supportive of world fusion music have suspended operations or are cutting their seasons. For our 36th season, we need your help to replace lost operating income caused by diminished arts support. More info. Sign the guest book and register for a newsletter including contests with prizes including concert tickets, CD's, etc! Ancient Future also performs at weddings, corporate events, parties, etc. The booking page has all the information you need to schedule an engagement.